Signs Your Chimney Repair Needs | Chimney Repairs | Kent Chimney Inc. The best way to prevent chimney fires is to contact one of our chimney contractors when repairs are needed. Below are some of the common signs that you’ll need to schedule chimney repairs. In order to see the mortar joints on your chimney, you’ll need to get up on the roof. Mortar is the cement mixture used to bond bricks together. When mortar hardens, it creates the vertical and horizontal joints you see in chimney masonry to hold bricks in place. For the best results, cracked mortar joints will need to be fixed by a chimney repair contractor. Rust on the damper or in the firebox is a sign of trapped moisture. If the chimney damper suddenly becomes difficult to open and close, you may want to check for rust. Chimney flue linings can also crack when exposed to too much moisture, which increases the risk of chimney fire. We can determine the cause of the trapped moisture, as well as replace compromised flue linings. If chunks of brick and mortar have been falling out of your chimney, you’ll want to contact a licensed chimney contractor as soon as possible. Spalling happens when water saturates bricks and freezes inside. Other signs of spalling bricks include peeling or flaking. It’s not uncommon for flue tiles to crack when exposed to moisture. Unfortunately, the chimney flue lining will need to be replaced if it starts showing signs of damage. This is because the flue lining is responsible for protecting your home from the high temperatures inside the flue. Flue lining damage can be spotted during professional inspections. You may also notice thin slices of flue tiles in the hearth. 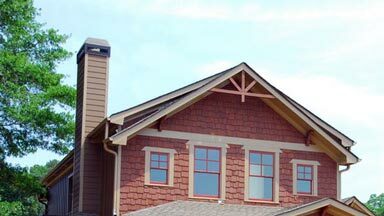 Like the name suggests, a chimney crown is located at the very top of your chimney. The crown prevents water from seeping into your chimney to cause damage. However, a cracked chimney crown won’t offer the same level of protection. Repairing a cracked chimney crown as soon as possible will spare you from making expensive repairs in the future. Kent Chimney Inc. is a chimney repair company dedicated to helping homeowners keep fireplaces and chimneys safe and functional during the cold months. If you are interested in our chimney repair services, give us a call at (616) 949-7722.